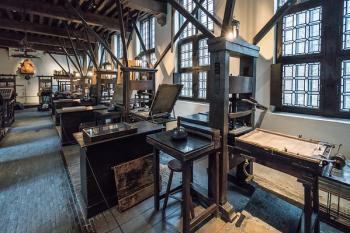 The Plantin-Moretus Museum is linked with the spreading of ideas of European humanism via its printing business Officina Plantiniana. The museum is housed in the former residence and printing establishment of famous printers Christoffel Plantijn and Jan Moretus. Plantijn (Plantin) set himself up as a printer in 1555, founding his publishing house 'De Gulden Passer' (The Golden Compasses). In 1576 he moved his printing business to the Vrijdagmarkt square. That building is now the oldest part of the Plantin-Moretus Museum. Plantin's business instinct turned his company into a thriving enterprise. In six years' time the number of presses tripled from five to sixteen. By 1575 he was running a printing empire with seventy employees. His son-in-law, Jan Moretus, inherited the business after Plantin's death in 1589. He and his successors printed far less humanist and scientific publications. They were mainly oriented towards religious documents (promoting the catholic Counter-Reformation). The archives of this museum were already on another Unesco list since 2001: the Memory of the World. 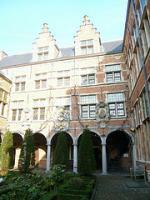 This museum is located in a patrician's house on a quiet square in the center of Antwerp. It really shouldn't be missed by anybody interested in history (or WHS). There's much more to see and tell than can be said on this one page. The whole museum is excellent. I spent about two hours there doing the rounds with an audioguide. Its special attractions are threefold: a great building with period furniture, the introduction to the 16th and 17th century printing business and the priceless collection of books and prints. The Plantin-Moretus family was very wealthy and collected many original pieces (like a Gutenberg Bible). There are about 30 rooms you can enter, ranging from libraries to the family bedroom. The craftmanship of the printing industry is detailed in a video. After that, you can amaze yourself at the collection of materials and instruments that is still there and looks like it could be working again any minute. They were printing in French, Greek, Latin, Hebrew and even Ethiopian. Mistakes were spotted by editors and then corrected before the final prints were made. 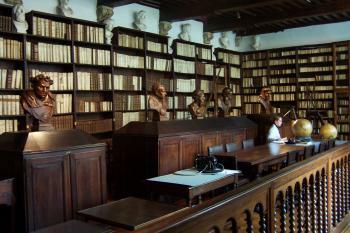 The United States celebrates National Library Week each April, but libraries in the US and around the world would be in poor shape were it not for publishing houses and the printed word; hence, the Plantin-Moretus Museum in Antwerp, Belgium, finds its place on the World Heritage Site list. I had high expectations for the museum when I visited last August, and the audio tour I took easily met those expectations. 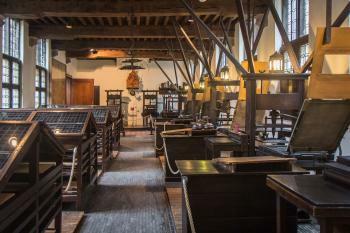 The Plantin-Moretus Museum showcases a 16th century publishing house run as a family business. While walking through the house, guests have the opportunity to view and learn about the library, typesets and printing presses (including the two oldest printing presses in the world), and famous works the family had printed, including the Biblia Polyglotta and an atlas by fellow Antwerpenaar Abraham Ortelius. I was particularly amused to learn that Times New Roman, a font I use often when writing, is based on a typeface designed by the Plantin Press. 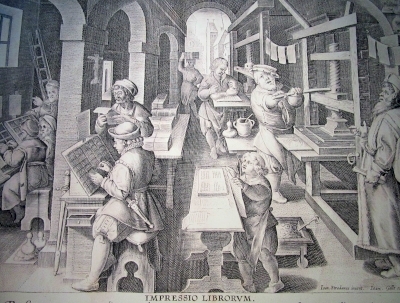 In addition to printing books, the presses also were used for illustrations and drawings, including a fantastic piece showing what the business looked like 400 years ago. I highly recommend this site to anyone visiting Belgium. Logistics: The Plantin-Moretus Museum is a short walk away from central Antwerp. Johannes Gutenberg’s movable-type was quicker than the traditional woodblock printing. This paved the way for the rapid printing of the bible (“Gutenberg Bible”) which eventually placed the movable-type as an important “invention” in the early modern European period. The printing press even assisted Martin Luther in the quick dissemination of the infamous “Ninety-five Theses” or “Disputation on the Power of Indulgences” which shook the authority of the Catholic Church. Eventually, the technology of the press rapidly spread in the European continent. One of the figures who was influenced by Gutenberg’s invention was Christophe Plantin. Plantin’s printing company was founded in the 16th century. The workshop (printing press) was established in his house in Antwerp, Belgium. During his time, Plantin was considered a major figure in printing, especially since he was constantly printing manuscripts in the humanities. Today, the once-upon-a-time workshop house and mansion is now a museum. The 16th century-printing technology and system is still functional. Once in a while, some documents/manuscripts are still being printed through the movable type. Now known as the Plantin-Moretus House-Workshops-Museum Complex, it is a UNESCO World Heritage Site, nominated by City of Antwerp in 2002 and finally inscribed in 2005. The museum was excellently curated. Entering from the first section ("the house") to the workshop itself was a walk back in the early modern era - the decorations, the arrangements of the furniture and the ambiance. 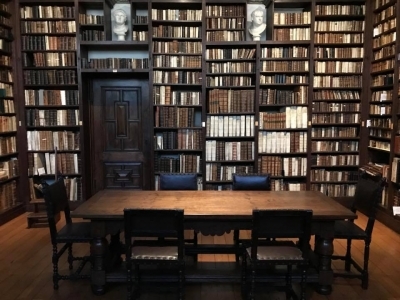 The museum houses a massive and impressive collection of 16th to 19th century printed collections - mostly manuscripts printed by Plantin and his son-in-law, Moretus. Some of the important collections in the museum are: the Biblia Polyglotta (printed between 1568 and 1573), Cornelis Kiliaan's Thesaurus Teutoniae Linguae (the first Dutch Dictionary), Abraham Ortelius' Theatrum Orbis Terrarum(the first printed atlas), a 16th century book of herbs called Cruydtboeckcollated by Rembert Dodoens, an anatomical book by Andreas Vesalius and Joannes Valverde, Simon Stevin's book of decimal numbers, 36 line Bible, Peter Paul Ruben's drawings and paintings, and a collection of Justus Lipsius works (most important work printed was his book of history). For printing enthusiasts (book lovers as well), do not forget to visit the workshop. On a personal note, I found myself appreciating more the value of printed materials: its significance in the history of communication and information. According to the website of the complex, the workshop is the "heart of the mansion." It contains the two oldest printing presses in the world, dating from around 1600. The six other presses are still in working order. More about the museum-complex, visit my blog. I visited here in January of 2017. The Plantin-Moretus House was more interesting than I thought it would be. What made is so interesting is that a single family lived in the same house for several centuries, running a printing business in the same facility. Because of the continuity, they preserved some of the oldest printing presses and printing material in the world. The house also contains several original paintings by Rubens, which you would otherwise have to go to an art museum to see. The site is located in the heart of Antwerp and is easy walking distance from the Cathedral and other attractions. Read more about the Plantin-Moretus House-Workshops-Museum Complex on my website. When you visit the Platin-Moretus Museum, there are a few different elements to explore. The first is the building itself, which is architecturally significant. Inside, you’ll also find the living quarters of the family – grand rooms filled with collectables and less lavish areas for the staff. It’s worth taking note of a small room on one side of the house which looks like a quaint old bookstore. In fact, it is, and the company sold books from here directly to people on the street. A highlight is stepping into the Great Library. This was designed like a private humanist library of the 17th century with busts, globes and paintings decorating the areas not taken up with books. Although the collection of books here has been expanded since the library was created, it’s still an authentic representation. This museum is really a hidden treasure that the crowds that flock to Antwerp's cathedral and market square, which are really just a few steps away, often overlook. It has been described in detail on this page already, and I can certainly say that it would be a big mistake to leave this great city without visiting the Plantin-Moretus Museum and learn more about printing, books, atlases, libraries, history, philosophy, geography - the beginning of the modern world, really. On a side note, just around the corner (almost) is the entrance to the St. Anna Tunnel, where pedestrians and cyclists can cross the Schelde River underwater to admire the city's skyline from the opposite bank. I had visited Antwerp twice and didn't know that this WHS museum was there! It is really interesting and well worth a visit although quite expensive. I strongly agree with Ian. I visited the museum this April and loved it. Incomprehensible why in some Antwerp travel guides the museum isn’t even mentioned as a highlight. The museum is definitely a must to see in Belgium. It’s really easy to reach, as it’s in the centre of Antwerp, a few minutes walking distance from the main square. I think everything about the museum is already told by Ian. I just can ad that apart from the museum, Antwerp itself is well worth a visit (the small Belfry is also Unesco listed). The main square can compete with those from Bruges or Brussels, there is a gigantic cathedral and the train station is more kind of a palace. Further it seems that there is a restaurant for every kitchen of this planet. 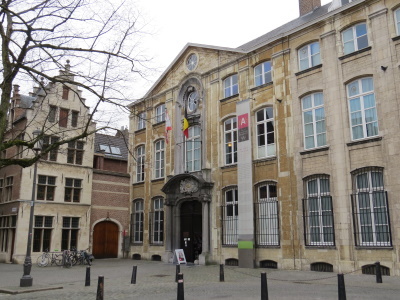 If you go to Belgium it would be a big mistake not to visit Antwerp and the Plantin-Moretus Museum. This is a truly fantastic site, sometimes I wonder about the merits of later and more esoteric additions to the list; however this place fully warrants its inclusion. The building itself is pretty impressive and the level of decoration throughout is striking, especially the guilt leather wall coverings. The courtyard is also very nice and many of the rooms look out onto it. The exhibits themselves are world class, notable are; the two oldest printing presses in the world, original works of many important Humanist philosophers (of whom Justus Lipsius once worked in the house), masses of typographical matrices including originals by Garamond (it is almost certainly in your font collection on your computer still), many book decorations by family friend Rubens with their original printing plates and a 36 line Gutenberg Bible! On top of this are the entire accounts of the Officina Plantiniana starting from 1555, which are included on the UNESCO Memory of the World list in their own right. There is so much more but not enough time to list all on display. The highlight for me was the Geographical room featuring several globes masses of maps and what is regarded as the first printed Atlas. The thing that makes this such a special site; and a main reason ICOMOS sighted for its inclusion, is that it is all in situ. These were where most of the items displayed were conceived/ created/ printed, all in Antwerp which was a key centre of early printing. The free audioguide was exceptional; it did a fantastic job of weaving the philosophical and practical aspects of the Renaissance and Counter Reformation together and illustrating their progression and contemporary relevance. A world class site and should not be missed, it was the site with which I "completed" Belgium and stands out as a highlight for me. A personal favourite WHS. 3.5: Gary Arndt Daniel Chazad Peter Loov Alias65 Tevity Martina Ruckova Wojciech Fedoruk Klaus Freisinger David Berlanda Peter A. Built in the 16th century: Christoffel Plantin set himself up as a printer in 1555, founding his publishing house 'De Gulden Passer' (The Golden Compasses). In 1576 he moved his printing business to the Vrijdagmarkt square. 209 Community Members have visited.